Tied around your waist, this pareo is the perfect beach coverup over your cute bikini or one piece suit! 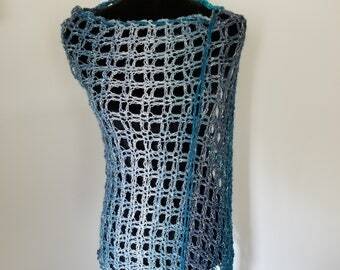 This intricate lace look scarf is hand crocheted in a triangle shape with a scallop design at the tip. The attractive belt can be tied at the waist or used as a shawl over a pretty dress in the summer or wrapped up as a neck warmer on cooler days. 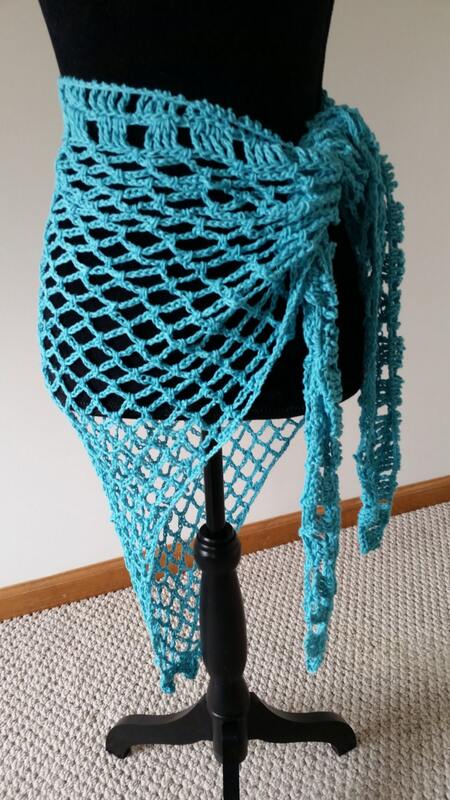 I used an bamboo/cotton yarn in a brilliant turquoise. Use it on your next vacation or trip to the beach and you will attract much attention. It is very lightweight so it can be worn on hot summer days for the warmest Caribbean days. This scarf can be machine washed delicate cold cycle and line dried. It measures 64 inches at its widest point and 31 inches long. Fits average small and medium sizes, 34" - 36" waist. This turquoise shawl is ready to ship. I do take custom orders if you need this crocheted in a different color, but please allow two weeks to the custom order. Gorgeous shawl, well made, and super soft! I highly recommend this shop, you will be totally satisfied with your purchase!